It is time for another Blogger Bundle and I am so excited to share it with you! 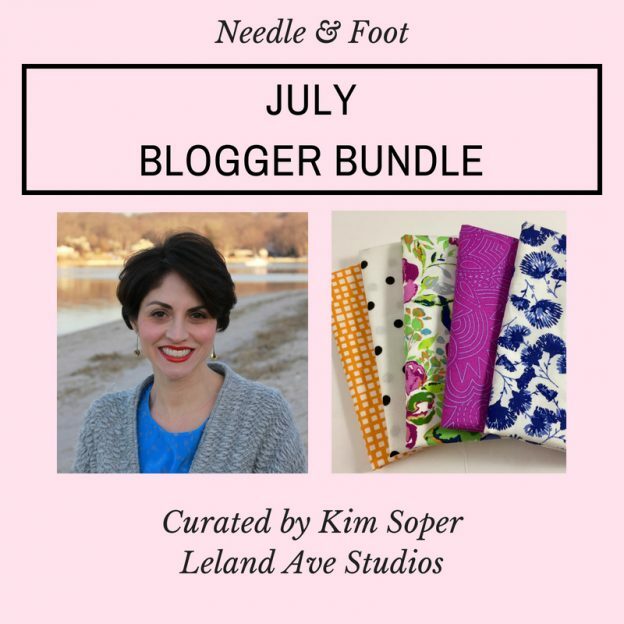 The July bundle was curated by Kim Soper of Leland Ave Studios. Kim is an award-winning modern quilter, a blogger as well as being a stay at home mom to three boys. Once an attorney, she decided to stay home to raise her boys and like many of us, she looked to sewing to fulfill her creative need. Kim’s “about me” page is great and I encourage you to take a minute and read it, if you haven’t already. I especially like the part about how she came to name her business Leland Ave Studios. 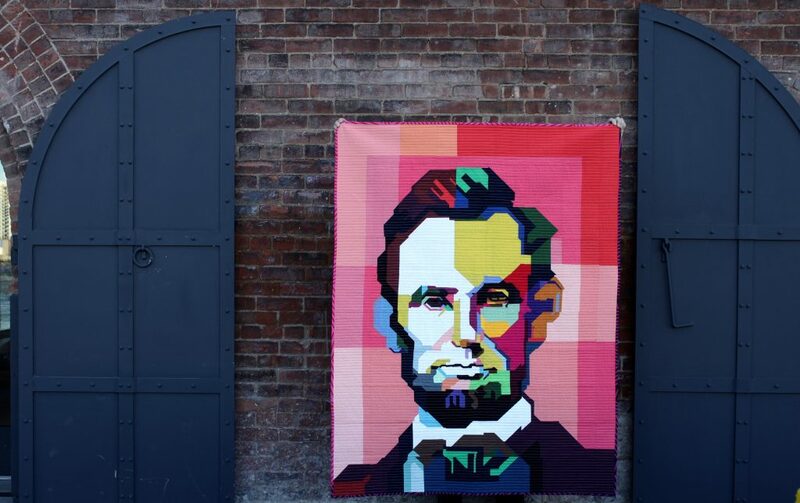 Lincoln, designed, pieced and quilted by Kim Soper. This quilt (passion project!) developed out of a desire to create an entirely improv-pieced, recognizable image without use of template, paper-piecing or applique. Using an iconic image of Lincoln that had been converted to WPAP (vector-based geometric pop art) by Ihsan Ekaputra, it was constructed using 6-inch blocks. The backing fabric is a repeating pattern of the original image of Lincoln. The binding is a nod to the vector-style of art on which the quilt is based. The end result is a quilt that is both identifiable as the intended image, and distinctly my own. To read more about the process she used to design and create this gorgeous quilt, click here. Following that, I began following her to read the weekly interviews she has been posting since the beginning of 2018 in The Creativity Project. Oh my gosh – talk about a dose of weekly inspiration. The series is wonderful and while I have enjoyed reading interviews with creatives I am already familiar with, I have really loved meeting many whom I hadn’t been familiar with. I am grateful for the work Kim has done to create this weekly series. Suffice it to say, Kim is a huge inspiration to many in the quilting and creative community. I was so happy when she agreed to participate in my Blogger Bundle series this year. Want to see the bundle she curated? Kim wanted a modern collection that had a summer vibe. I think she definitely got it! Both of the florals are from a new collection called Indigo & Aster by BariJ. She pulled in more fuchsia with the piece on the far left from Alison Glass’ 76 collection. 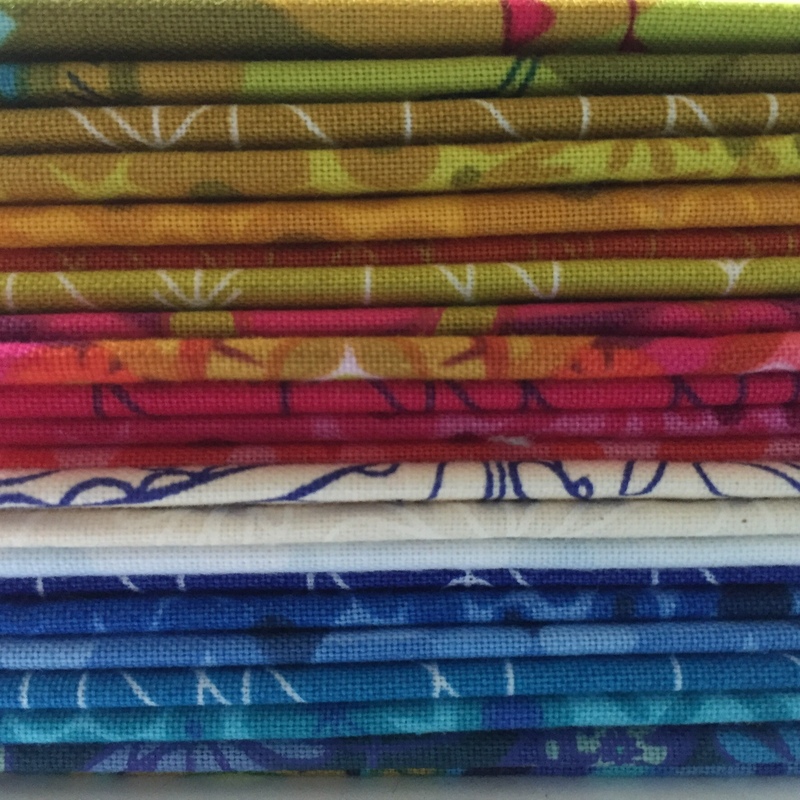 To keep it bright and summery, Kim added Squared Elements in Mandarin, from Art Gallery Fabric. Finally, she chose a neutral and added the black and white polka dot made by Red Rooster Fabric. This might be my favorite move on Kim’s part. It moves the collection away from the femininity of the floral and adds whimsy to the bundle. Once again, I have so enjoyed working with a quilt artist and seeing how she gathers fabrics from various lines in my shop and uses them together. 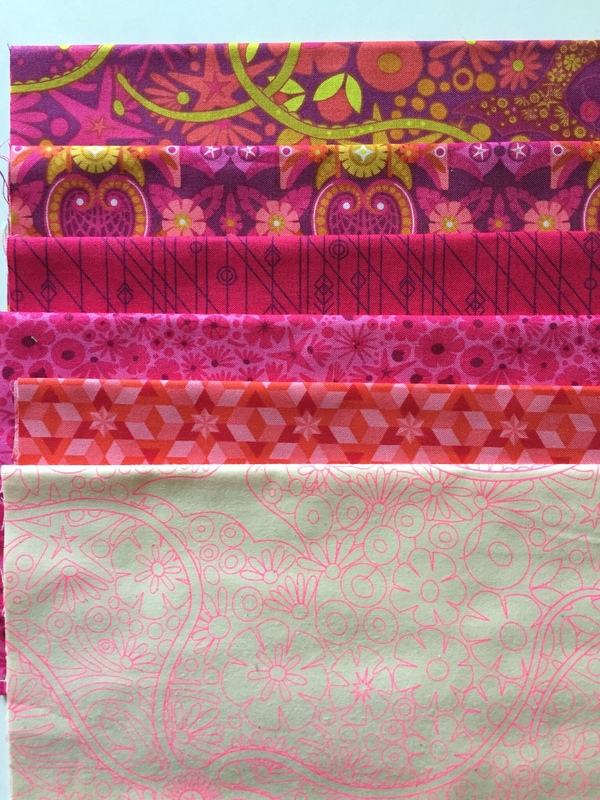 Kim made a really cool, non-quilty, project with this bundle. Head on over to see what she made. I just love it! 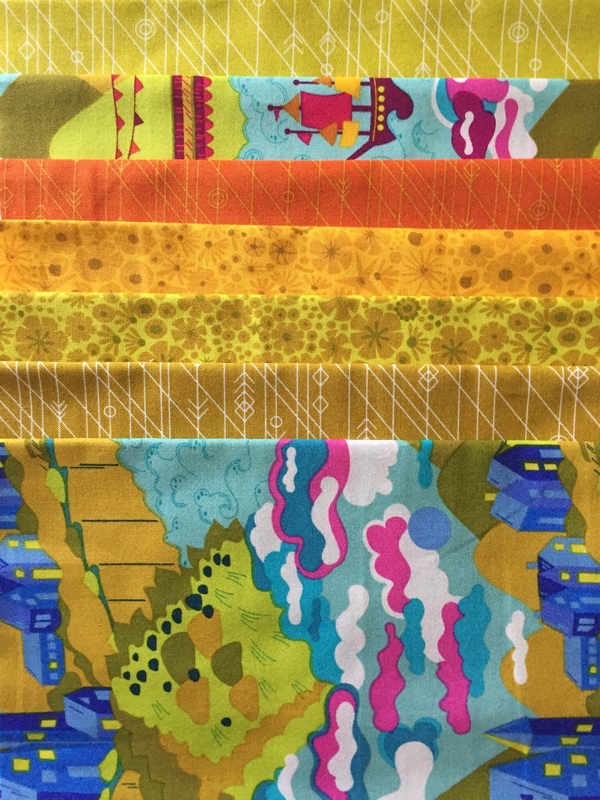 As before, this bundle (in either fat quarters or 1/2 yard cuts) is on sale in my shop for 20% off today through Wednesday of this week. 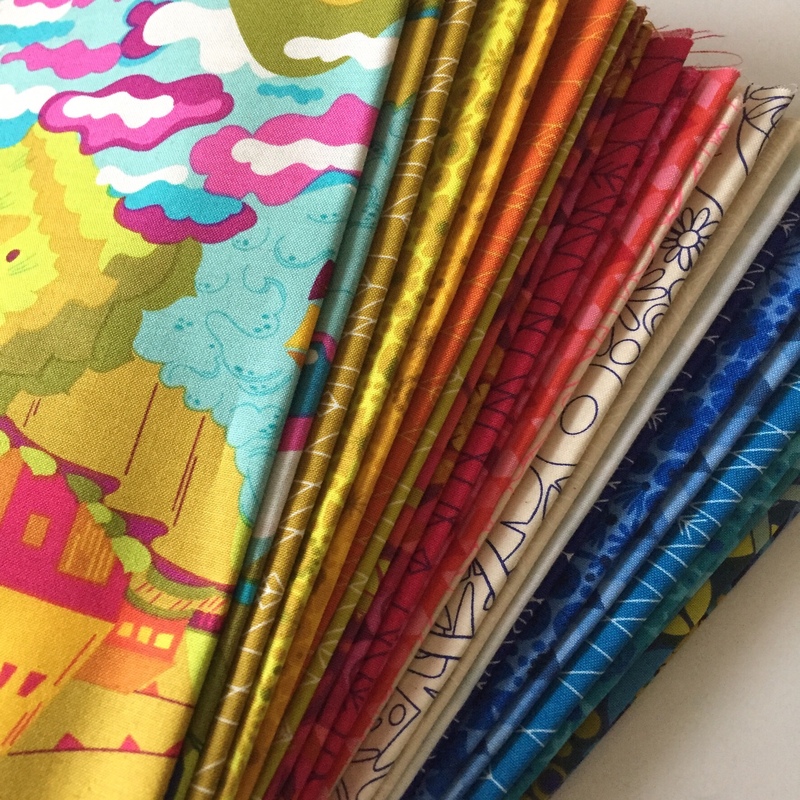 Also, there is a giveaway – one lucky winner will receive a fat quarter bundle to use however they please. Normally the blogger who curated the bundle hosts the giveaway but this time, I will host it. Kim is getting ready to go on a vacation to Italy with her family and we decided it would work best if I held the giveaway. She has enough going on getting ready for their trip. 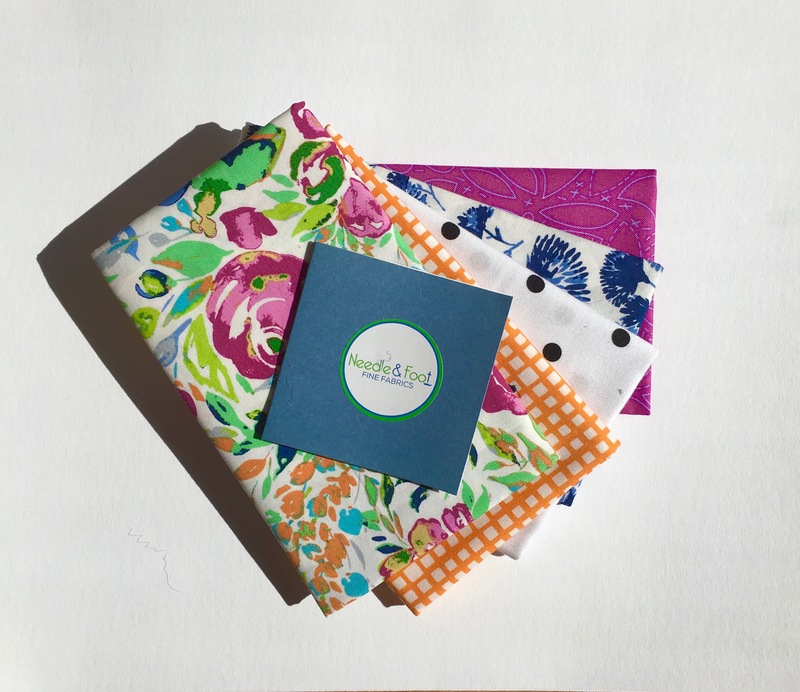 To enter, please comment and tell me what you think of the bundle – why do these five fabrics work so well together? Also, to be eligible to win, remember to follow me on here the blog, or on Instagram or Facebook. The giveaway is open through Wednesday of this week, just like the sale! If you purchase a bundle and then win one (which has happened in the past) I will refund your purchase price of the bundle. Thanks so much to Kim for the bundle she has curated for my shop. I hope you are enjoying these collections as much as I am!! 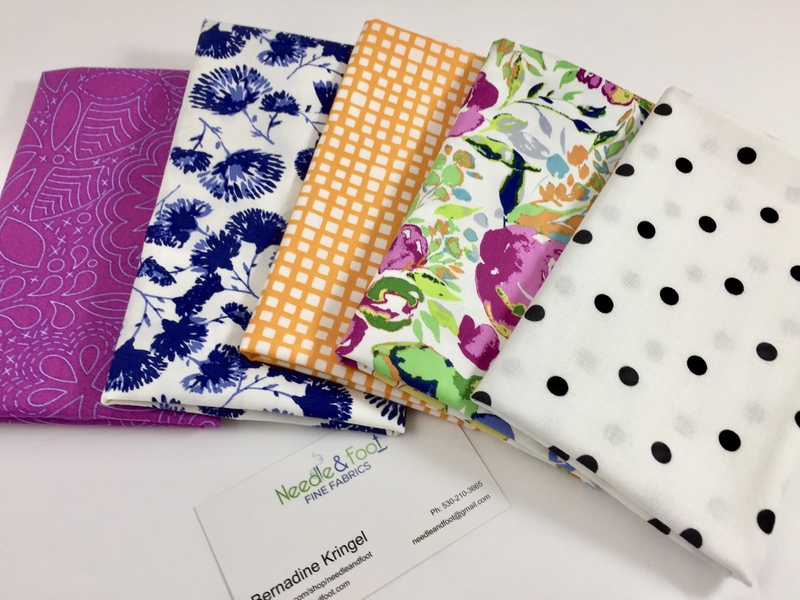 This entry was posted in My Fabric Shop and tagged barij fabric, blogger bundle, curated bundle, indigo and aster, kim soper, leland ave studios on July 16, 2018 by Bernie. If you follow me on Instagram or Facebook, you may have seen the pictures I posted over the weekend. Julia and I took a road trip and visited Cal Poly in San Luis Obispo. This college is a favorite in our family – I graduated (class of ’82) and two of my sons plus one daughter-in-law also graduated from there. Julia is planning to apply there next fall. We thought it would be fun to do the college tours and see the campus as it has been several years since we have been there. Plus she was pretty young when we last visited and I thought she needed to see it with a more mature viewpoint. It was a beautiful day of tours and walking… oh, so much walking. 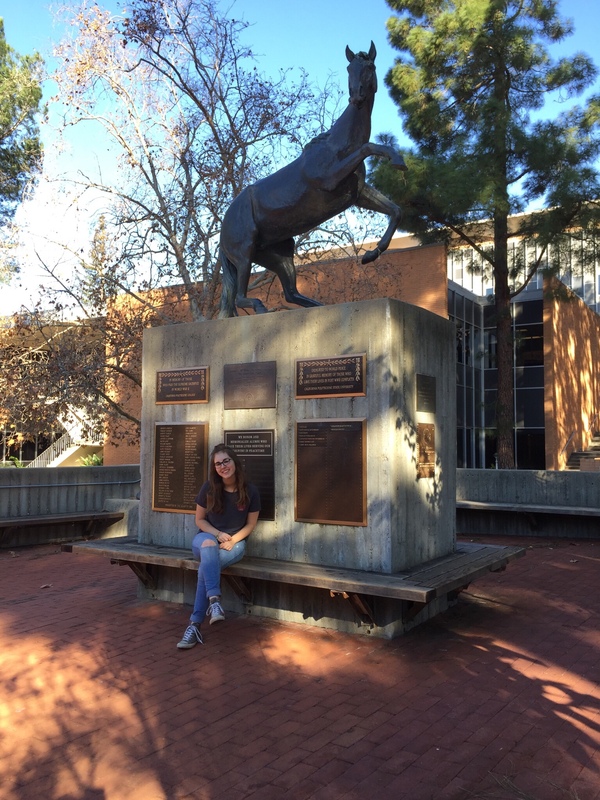 Julia is deciding between Biology or Animal Science as her major. It is so hard to know what you want to do at this age but Cal Poly is a university that requires the applicants to declare their major right away. 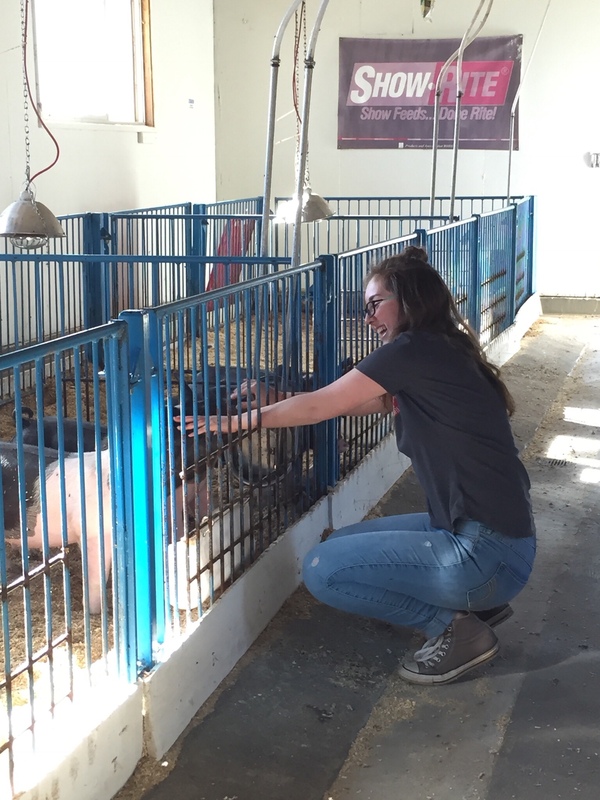 She was thrilled to be able to visit the Swine Unit. The manager of that unit, a senior at the university, was incredibly friendly and let Julia hang out for quite a while. 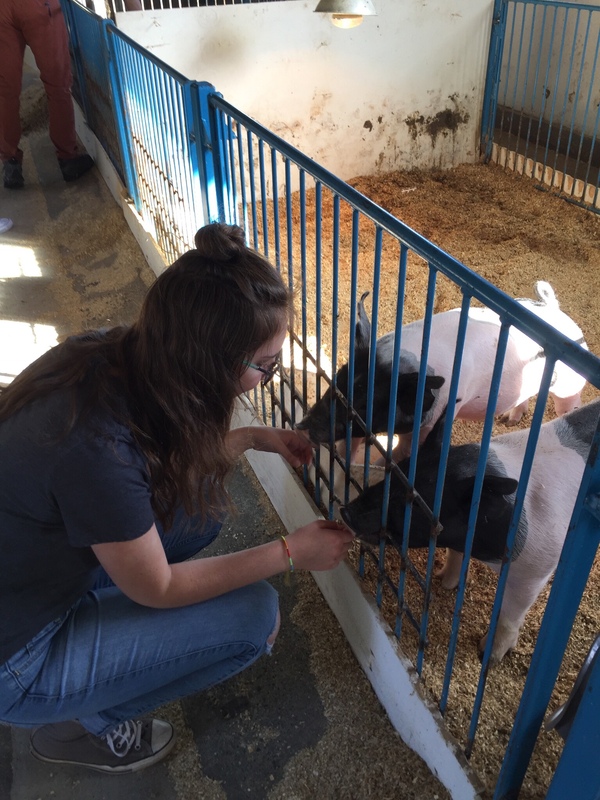 It was helpful to find out Julia can volunteer at the animal units even if she chooses Biology over Animal Science as a major. Either way, she can work with the animals.. It was a quick trip but well worth the drive (which is a bit of a pain because we live 350 miles from campus). When I got home I had a package waiting for me! A couple of weeks ago I entered a giveaway on Instagram. Kim over at Leland Ave Studios was celebrating the launch of her 52 Week Creativity Project where she will be posting discussions with various artists each week in 2018. I read the first one which was really good. I am looking forward to this series. Kim generously gave a fat eighth bundle of Alison Glass’ new line, Diving Board- to me! What a treat. Oh my gosh! I was so tickled to win this bundle. The colors fall in line with the shades of blue, pink, greens, yellows and oranges that Alison often uses. This is nice because her older lines work so well with the newer pieces. Oh the colors are gorgeous !! This bundle is a big one at 24 pieces. I will surely let it sit for a while – until I think of the perfect use for it. I have several projects on-going at the moment so I am in no hurry to start another one. Thank you Kim for this gorgeous addition to my stash. 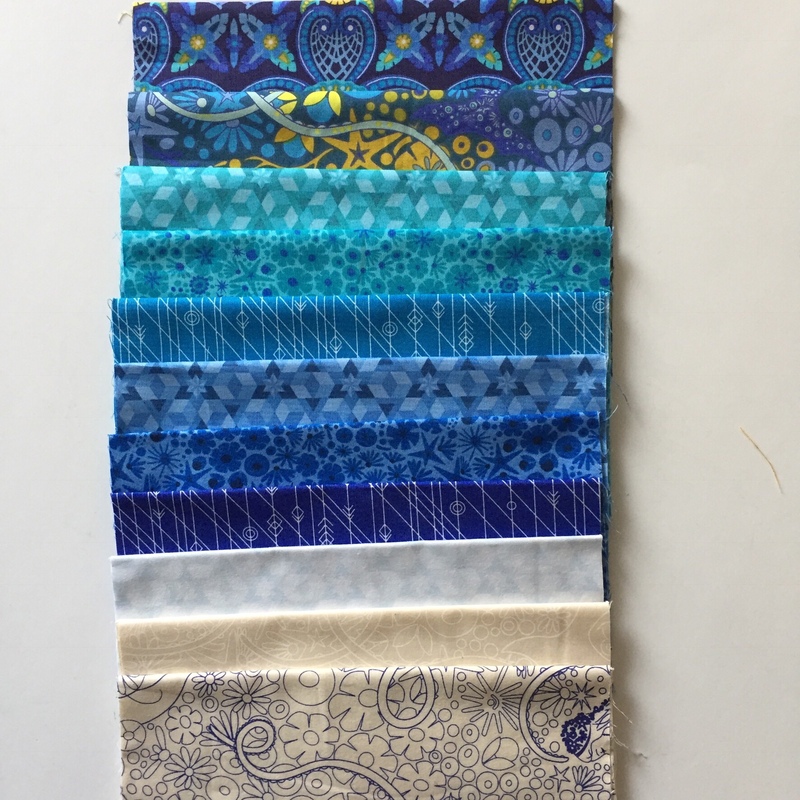 This entry was posted in Family, Stash and tagged 52 week creativity project, alison glass, diving board fabric, leland ave studios on January 15, 2018 by Bernie.